A linguistics professor and her family find their bonds tested when she is diagnosed with Early-onset Alzheimer’s Disease. When Alice is preparing for the arrival of her family for a Christmas meal, she forgets how to make a certain dish. So has to use her mobile phone to jog her memory. Shortly after, her son arrives with his girlfriend – who introduces herself to Alice, and likewise. Brief conversation flows as she finishes up in the kitchen and joins them at the dinner table. And as Alice sits down, she holds her hand out and introduces herself to Jenny. Again. As if she’d never met her a few minutes previously. This fascinated me. Obviously I knew the plot, but the way in which Julianne played it was fantastic, very natural. In fact, I can’t fault the woman in any part of this movie. The startled looks on her face, the screams of shock, she nailed it. The main thing here is you’re not just watching a woman lose her memory and slip further into a tragic disease, but watching how she deals with it. This whole movie encompasses Alice’s reaction to the early onset of Alzheimer’s. 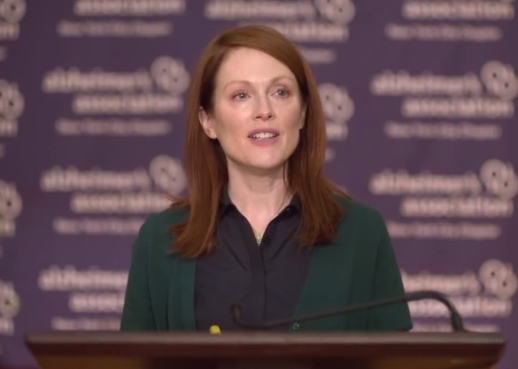 At one point she had me in tears – for a brief moment during the scene where she gives a speech at an Alzheimer’s conference, I cried at what I was watching. Keep your eyes firmly on the screen during the ‘speech’ scene. Julianne gives a performance so full of emotion that it’s not to be missed. Thing is, she doesn’t go overboard – she just delivers a normal speech. But it’s all in her acting skills here, which come through blindingly clear. Shaky voice as she speaks which slowly builds to her welling up, and pure determination in her voice. I won’t lie – I had tears running down my cheeks. It was emotional stuff, because it was played so naturally. 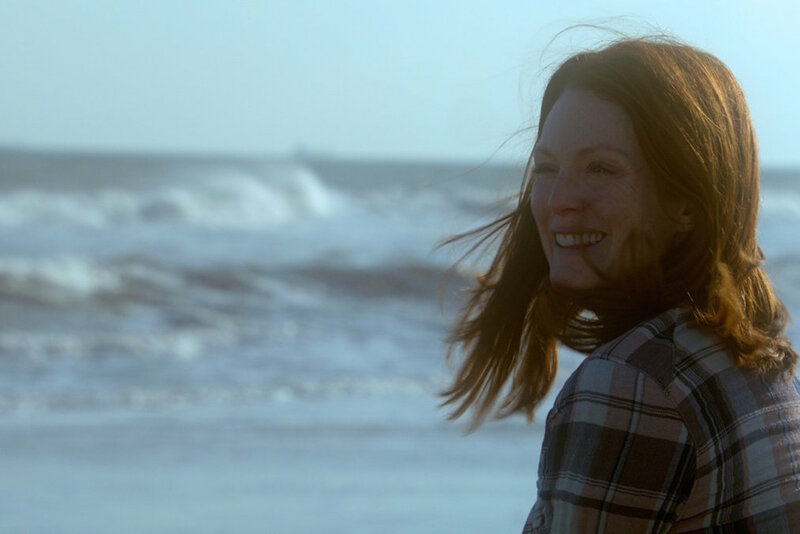 Still Alice makes a perfect ‘example’ movie. An educational movie. Something that should be played to those who have just discovered they or family member have Alzheimer’s disease. The way in which the movie is directed ensures the storyline emerges immediately, and highlights this serious medical condition in a different light – whereas most other movies concentrate purely on entertaining the audience. Yes, I’m aware Alzheimer’s isn’t something you can make entertaining, but this movie certainly pinpoints the problem and creates a strong impact. From how the sufferer deals with her issue, to how her family gets used to it, Still Alice breaks it down into segments; symptoms. Reactions. The journey. Deterioration. This movie isn’t entertainment – it’s information. Brought to life by a strong actress who plays her part effortlessly. This movie had me interacting vocally. I laughed, cried, tutted out loud, I even gasped at one point. But in the back of my mind, I wondered if I should be laughing at certain bits..
One example is the scene where Alice and John rush to see their daughter Alice in hospital – she has just given birth.. “what’s the matter with her, she looks terrible! ?” Alice cries as they enter the room. Inappropriate? Normal reaction? I felt a bit bad for laughing, but it was genuinely funny! The way Moore delivered the line was great. Another scene where Alice forgets to attend a dinner party with her husband made me hoot too; when John scolds her for not going, she responds, “Oh, I’m sorry. I have Alzheimer’s”. There are various lines like this that pop up in various scenes, so although you may think you’re sitting down to watch 99 minutes of sheer misery, the producers actually manage to soften the blow with some lighter dialogue. I’m a bit torn about the end of this movie, because of its style of presentation. Again, it would make the perfect study / information video for those having to deal with Alzheimer’s. In which case, fine. You get your dose of the condition, symptoms, medical advice from doctors and how people deal with it, then the footage comes to an end. Done. Entertainment wise, you get an emotional slice of a serious condition, which then fades out abruptly. I have to say I was a bit disappointed with the end – I wanted more. More of Moore, because the woman did so well in delivering her character. The passion and skills displayed in her performance were just superb, I felt a bit miffed as it all ended. 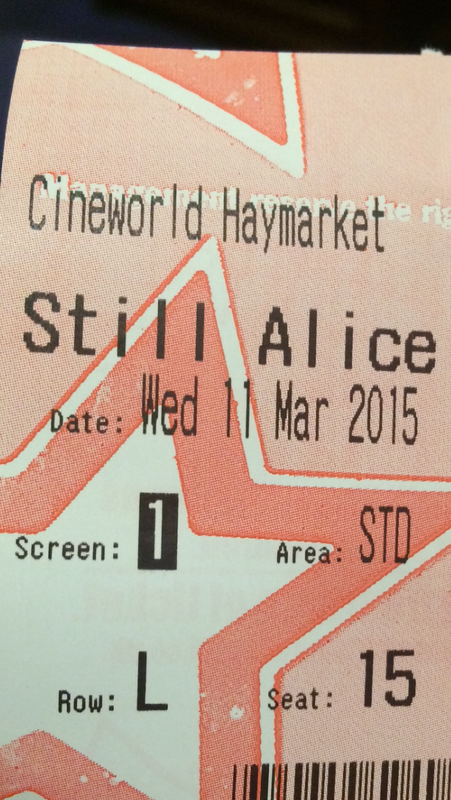 Still Alice was brilliant. Why? 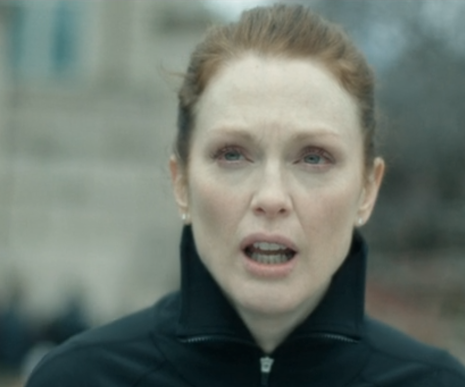 Because of Julianne Moore. The woman singlehandedly carried the entire movie with her performance of a woman struggling to cope with a serious condition. There were moments where I wondered if I’d reacted tactfully enough, because laughing at seemingly humorous one-liner’s felt slightly disrespectful. 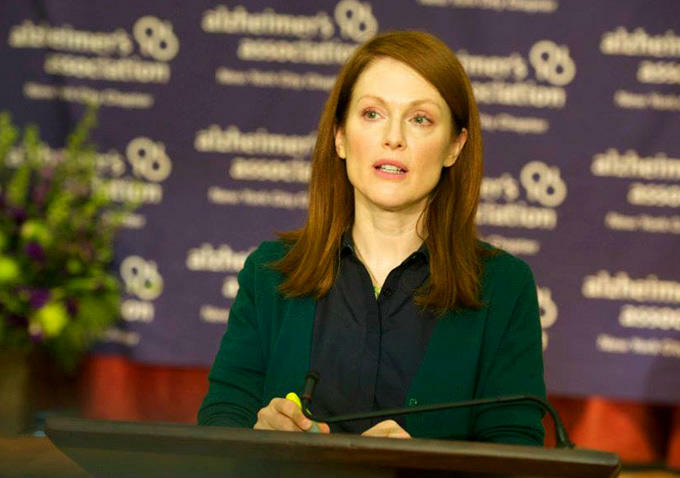 That is where Still Alice walks a fine line; although very serious, it contains a few funny bits. Still, it remains highly emotional and gripping. This movie is a striking look at sufferers of Alzheimer’s disease but mainly how people deal with it. It is definitely worth a watch, especially of you or someone you know has been affected by the condition. 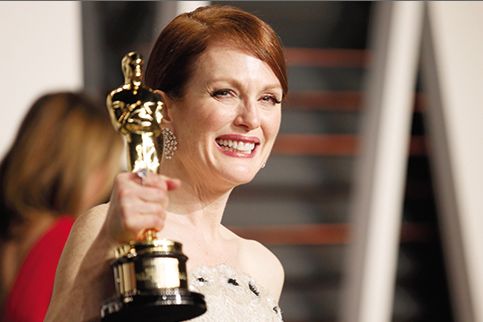 Praise to Julianne Moore – she couldn’t have done better. This entry was posted on March 18, 2015 by rickysfilmreviews.